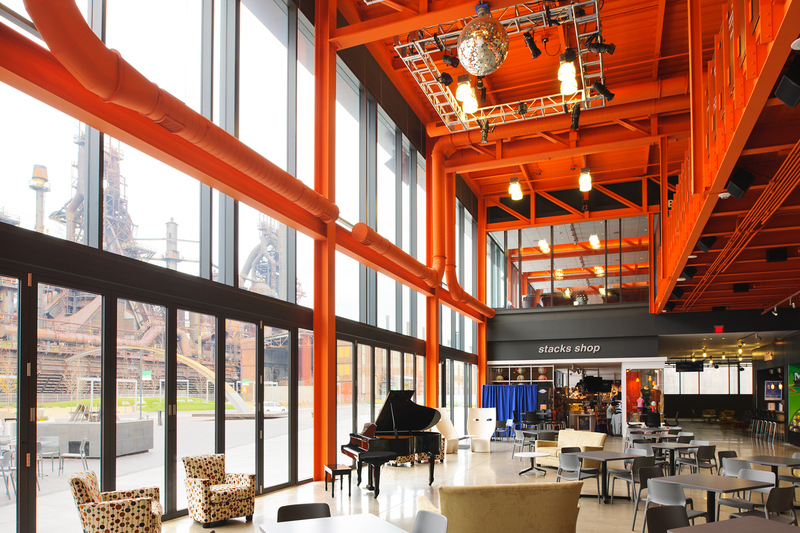 Pennsylvania’s ArtsQuest Center at SteelStacks is a new 4.5 acre year-round art center located on a reclaimed brownfield at the western end of the 150-year-old Bethlehem Steel manufacturing site. Spillman Farmer Architects designed the 66,000-square-foot, $17.3 million arts facility as a transformative and transparent space, with an exterior featuring curtainwall and entrance systems from Tubelite Inc. 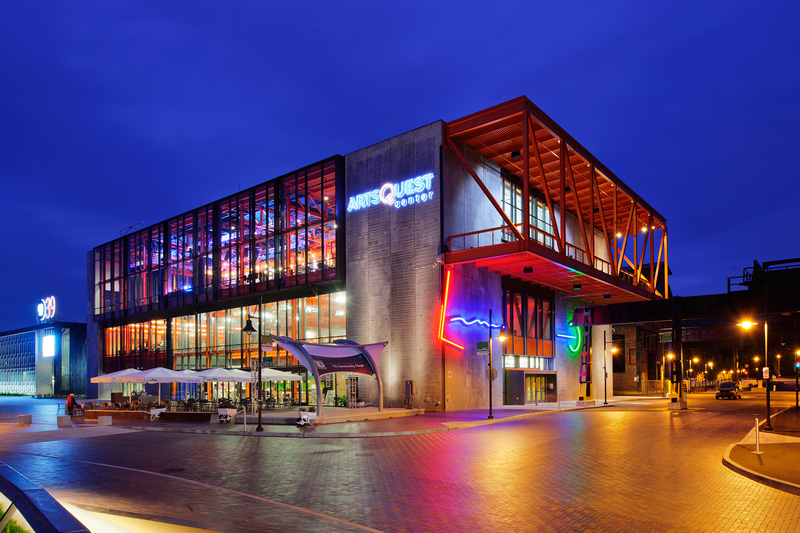 Located at the core of the campus, ArtsQuest Center houses performance spaces for a multi-disciplinary arts program offering more than 1,000 concerts and eight different festivals annually. It includes a two-screen art cinema; 600-seat Musikfest Café live music venue; and the 4,000-square-foot Blast Furnace room, which will host a variety of community and educational functions. The facility is part of a master plan developed by ArtsQuest, a nonprofit organization engaging in revitalizing communities through the arts, and by SteelStacks, a 10-acre campus dedicated to arts, culture, family events, community celebrations, education and fun. ArtsQuest raised $26 million to fund the Center, added to $40 million from the City of Bethlehem and the Bethlehem Redevelopment Authority (BRA). After a national search for an architectural firm and a rigorous interview process, Pennsylvania-based Spillman Farmer was selected for the firm’s understanding of the site’s history, technical expertise and thoughtful approach to making meaningful spaces focused on human-centered design. The facility’s design and construction also followed Silver certification criteria of the U.S. Green Building Council’s LEED® v2.2 guidelines for energy-efficient and environmentally sound new construction. Working closely with the Spillman Farmer, the owners, the specialty contractors and the product manufacturers, Alvin H. Butz, Inc. served as the project’s general contractor. Glazing contractor Hutt’s Glass, recommended and installed Tubelite’s 400 Series Curtainwall and Medium Stile Doors. Engineered for low- and mid-rise applications, like ArtsQuest Center’s three-story building, Tubelite’s 400 Series curtainwall’s durable framework provides exceptional structural performance, reducing the need for steel reinforcing. For this project, it features 2.5-inch sightlines with a 6-inch system depth on the interior and 8-inch depth on the exterior. Snap-on covers allow for different finishes on interior and exterior exposed surfaces, and silicone-glazed verticals are available for a seamless appearance. Tubelite’s Medium Stile Doors can be finished to match, complement or contrast with the curtainwall framing. Linetec finished the aluminum framing of Tubelite’s curtainwall and entrance systems in custom Charcoal Grey color blended in-house and applied as a two-coat 70 percent polyvinylidene fluoride (PVDF) resin-based coating. Linetec’s blending laboratory has six individual mix and match color systems, encompassing the three leading high-performance paint manufacturers. Tested to meet the stringent American Architectural Manufacturers Association (AAMA) 2605 specifications, these finishes ensure a durable, long-lasting performance. Linetec’s industry-leading practices also safely capture and destroy the volatile organic compounds (VOCs) present in liquid paints at the factory before arrival on the building site to support green building goals. Further contributing to projects’ sustainability, the aluminum used to produce Tubelite systems was extruded using EcoLuminum™, a high recycled-content aluminum billet composition. The aluminum-framed doors’ tie-rod assembly is as durable as welded-corner construction, but can be modified, disassembled or resized in the field for a precise fit. Making installation as easy as possible, Tubelite’ 400 Series curtainwall uses an exterior screw-applied pressure bar to secure the glass in place. For ArtsQuest Center, Spillman Farmer specified the largest possible expanses of insulated glass at 75 by 138 inches. In addition to its size, PPG Industries’ Solarban® 60 glass was chosen for its ability to block 62 percent of total solar energy, while allowing through 70 percent of visible light. Glazed in Tubelite’s aluminum framing, the high-performance curtainwall system provides year-round comfort and supports heating and cooling cost savings. Completed in 2011, ArtsQuest Center continues to attract attention and win awards. In 2014, Urban Land Institute (ULI) Global Award for Excellence for its role in helping to redevelop one of the largest Brownfields in the nation. In 2013, Architizer A+ Awards selected the project as a winner in the +Urban Transformation category. Also in 2013, Spillman Farmer was honored by the American Institute of Architects (AIA) Pennsylvania chapter as the inaugural recipient of the AIA Pennsylvania Firm Award recognizing outstanding achievements in the profession over the last decade. The previous year, in 2012, the AIA Pennsylvania chapter also presented the firm with a Silver Medal Award for ArtsQuest Center.